"It's disgusting." That was Salon writer Heather Digby Parton's declaration that Southern Republicans simply don’t want minorities to vote. Hey, Heather, I'll tell you what's disgusting. 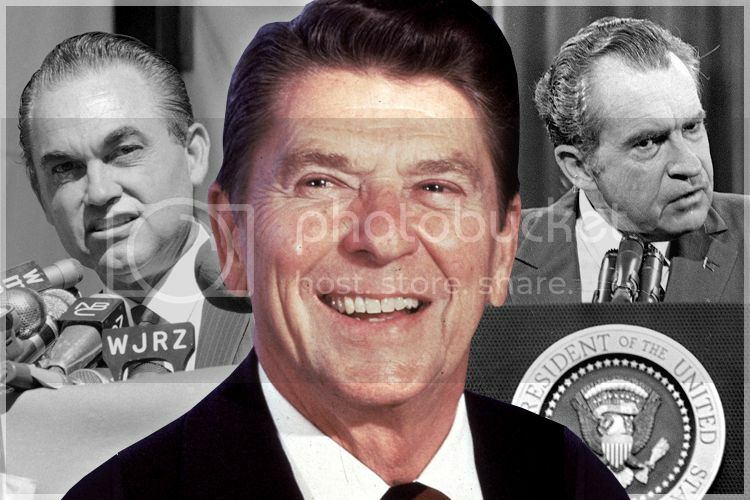 Your attempt to smear Republicans as racists based on historical "facts" that are completely inaccurate starting with including a photo (after the jump) of George Wallace along with Richard Nixon and Ronald Reagan as Republicans who supposedly wanted to suppress the vote. News flash! George Wallace, like Ku Klux Klan Kleagle Robert Byrd, was never a Republican. I hate to break it to you but he was a Democrat. In addition to the misleading photo, Parton's article is chock full of blatant attempts to rewrite history. The Georgia secretary of state, Brian Kemp, does not appear to be a current member of the Republican National Lawyer’s Association. However, his former general counsel and chief legal advisor until 2013 is. And here he is pictured on the RNLA’s Facebook page. And considering the RNLA’s blog praises him to high heaven for admonishing the first lady for having the temerity to call out the fraud that is voter fraud, it’s safe to say that Kemp is sympatico with their goals. And he is one of many Republican officeholders they have trained for a couple of decades now to keep that minority vote down as low as they can. For some reason they seem to think that racial minorities will never vote for them. You’d think it would occur to them at some point that their decades of vote suppression efforts might be one of the reasons. Officials in Muscogee County contacted Kemp's office, along with officials in DeKalb, Gwinnett, Henry, Bartow, and Butts counties. Muscogee County Elections and Registration Director Nancy Boren confirmed to News 3 late Tuesday night that her office had contacted Kemp's office. "The Muscogee Elections Office contacted the investigative division of the Secretary of State concerning voter registrations forms that have been received in the office with concerns about these forms and information contained on them," said Boren. "It would be premature to call it voter fraud at this point in the process." Boren told News 3 on Wednesday that her office contacted the state after they received voter registration cards that had conflicting information, cards that did not verify through the verification process and cards that were duplicated. So if the secretary of state did not investigate voter registration irregularities reported by 6 counties he would be derelict in his duties. However, by performing his duty this makes him a vote suppressor according to Parton. Their finest moment came in 2000 when the call went across the land for lawyers to converge on Florida to help litigate the disputed election. They were very good, having been schooled for a couple of decades in the dark art of election stealing. (CNN) – Experts hired by The Miami Herald and USA Today conducted a comprehensive review of 64,248 "undercounted" ballots in Florida's 67 counties that ended last month. The count showed that Bush's razor-thin margin of 537 votes -- certified in December by the Florida Secretary of State's office -- would have tripled to 1,655 votes if counted according to standards advocated by his Democratic rival, former Vice President Al Gore. Got that, Heather? Bush's margin would have tripled if the "undercounted" ballots had been checked as Gore wanted. Republicans who buy the nonsensical insistence by vacuous right-wing operatives that Democrats are the real racists because the Southerners used to vote for them will be very confused by this. Obviously, the parties switched places over civil rights. In reviewing this piece of history, and keeping in mind the southern political shift from Democratic to Republican during the era in question, I find it remarkable that only one of the 95 Democratic signers of the Southern Manifesto ever retained his seat by the strategem of switching parties. After 1963, attrition among the segregationists proceeded at a rate of about 50% every six years, but after Thurmond's switch in 1964 the remaining signers seem to have been comfortable in their original party (or perhaps unwanted in the other). Some advanced to high positions of Congressional leadership. Why did so many segregationists feel comfortable remaining in the "new" Democratic Party? The answer, I think, can be found by looking at a couple of segregationists who were not covered in this review. One of them is Strom Thurmond's Democratic doppelganger, Senator Robert Byrd of West Virginia. Byrd was an active recruiter for the Ku Klux Klan, and as late as 1964 he filibustered against the Civil Rights Act (which would prohibit segregation in public accomodations). Yet Byrd, like Thurmond, remained in office for decades after federal law had been settled in favor of integration. The second example is Governor George Wallace of Alabama. Wallace became famous in America for his "Stand in the Schoolhouse Door" attempt to personally block the integration of the University of Alabama. He ran for president as an independent in 1968, but also ran in Democratic primaries in 1964, 1972, and 1976. Despite being shot in an assassination attempt during his 1972 run, Wallace received nearly as many popular votes as the eventual Democratic candidate, George McGovern, and he won primaries as far north as Maryland and Michigan. Wallace was elected governor as a Democrat four times (and was succeeded by his wife once when he was barred due to term limits). His final term ended in 1987, nearly 25 years after he stood in the schoolhouse door. How did men like Byrd and Wallace remain powerful Democratic politicians after segregation ceased to be a Democratic policy? The answer, I think, primarily involves economics. Wallace began his career (see his New York Times obituary) as "an ardent New Deal Democrat." Byrd's pork barrel efforts for West Virginia were legendary, though they peaked in success (e.g., bringing Coast Guard support facilities to landlocked West Virginia) only after he assumed chairmanship of the Senate Appropriations Committee in 1989. The Longs of Louisiana were similarly redistributionist. Once segregation was eliminated as a permissible policy in either party, many of the former segregationists found that their other policies just fit in better with the Democrats, so there they stayed. So no big switch of parties as Parton claimed. The West Virginia Ku Klux Kleagle remained a Democrat as did George Wallace despite what the misleading Salon photo implied.